Mount Gnomon Farm rests against the Dial Range – a tract of wilderness that stretches from Penguin to Cradle Mountain in Tasmania’s north-west. 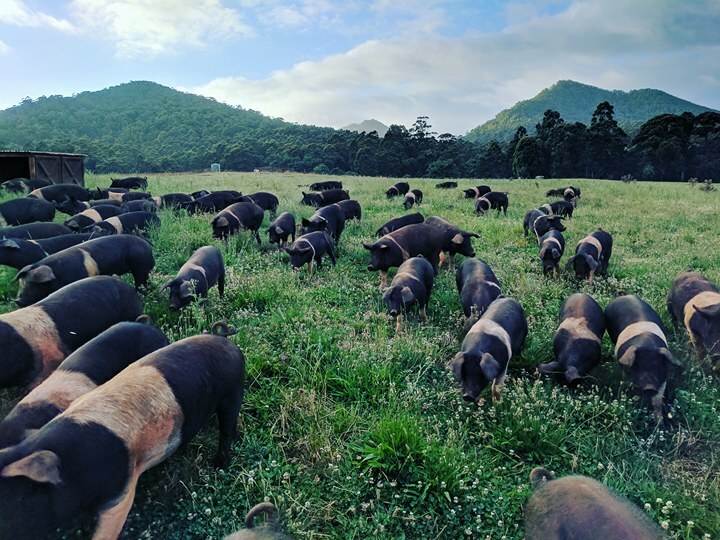 Guy Robertson welcomes you to the farm: to taste the ethically-raised meat and garden produce in our dining room, to forage in our gardens and to wander through the paddocks on a guided secret life of pigs tour, and to learn from a farmer how good, honest food is produced. We would love you to follow our adventure through social media. You can see what we’re doing today by searching for us on Instagram and Facebook, we update regularly and promote our farm Live at the Sty music events by creating an event page on Facebook. A Facebook event page allows you to easily share the event with friends so you can arrange for a group to visit the farm. 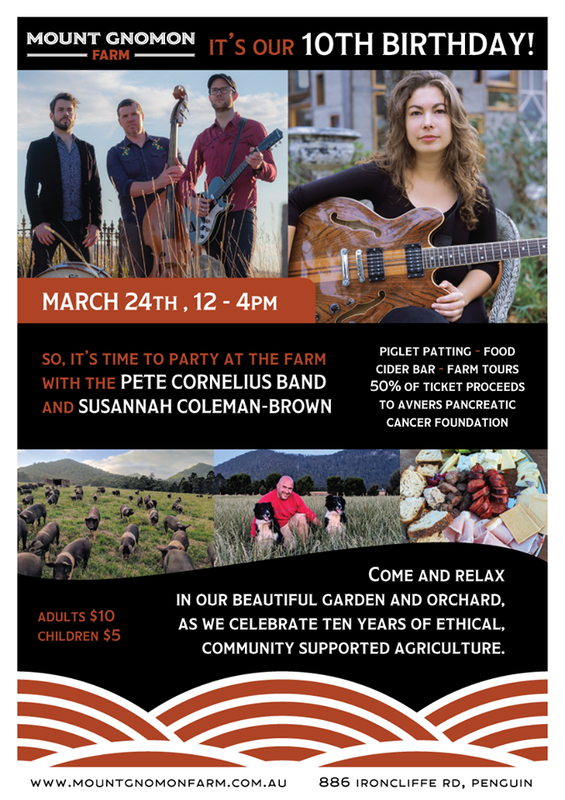 We welcome you back to the farm to celebrate 10 years of ethical farming, yummy food and pioneering community supported agriculture and to raise money for a good cause. 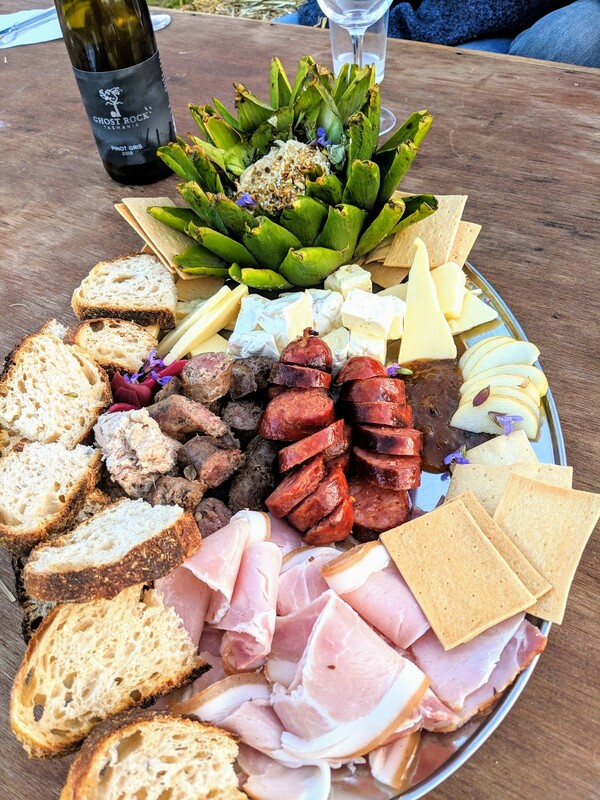 Grab a drink from the cider bar, some delicious food prepared from our garden and farm and pull up a hay bale or picnic blanket in our beautiful gardens and orchard and listen to the delightful tunes of Peter Cornelius and band. We’re also excited to have the beautiful voice of Susannah Coleman-Brown joining Peter and his band. There will be piglet patting, gumboot throwing, webber barbecue contests and meat smoking demonstrations. Farm tours will reflect on the learning of 10 years of free range farming and give a rare insight of farming beyond the farm gate. Adults $10, Children $5, with half of the entry cost being donated to the Pancreatic Cancer Foundation. If you haven’t been to one of our days they’re a great family day out with something for everyone. Our restaurant is open most weekends, give us a call on 0448067779 to see what is on the menu and opening times. Over the autumn months we plan to carry out pop up functions in the restaurant and open for lunch on the Easter weekend and for mothers’ day. Keep up to the latest news on our instagram and facebook pages.